How Ottawa Spends: Tracking Infrastructure | MGI Construction Corp.
What if the problem was not having enough money hence having to borrow to attain it but rather having so much money that you aren’t able to spend it all fast enough? Figuratively and literally, this conundrum lies at the heart of the Liberal government’s recent infrastructure budget releases—substantive amounts of money are being unrealized. I recall a professor, reflecting back on his 38 years of service in the public sector, underscoring a common theme that runs through policy analysis: the susceptibility for policy goals to “overpromise and underperform.” Let’s creep a little closer into how this process rolls out. The construction industry continues to be a stalwart of the Canadian economy, employing more than 1.2 million men and women and contributing $113-billion to gross domestic product (GDP). Respectively, these numbers represent 7.1% of total employment1 and just under 10% of total GDP by industry2—up from 6% ($73.8-billion) in 2010. Canada’s most recent budget announcement revealed plans to invest $180-billion nationwide in infrastructure over the next decade (Figure 1).3 Just a short while ago, federal Infrastructure Minister Amarjeet Sohi concluded negotiations that will effectually launch new projects across the country as part of the Investing in Canada Plan. This entails provincial and territorial transfers for specific infrastructure categories which include: public transit; ‘green’ (e.g., renewable energy, the Clean Water and Wastewater Fund); social (early learning and childcare, affordable housing); trade and transportation; and rural and northern communities (Figure 2).4 As granted through the federal budget, Infrastructure Canada (INFC) is primarily responsible for the overall coordination and progress reporting of the Plan while provincial and territorial governments are expected to work alongside other federal departments such as Natural Resources Canada, Employment and Social Development Canada, and Transport Canada for the project’s completion. With major projects spanning from the Southwest Calgary Ring Road, to the Gordie Howe International Bridge, to the Darlington nuclear generation plant refurbishment in Bowmansville, Ontario, to the Ottawa light rain transit system, to the Maritime Link transmission line, the size and scope of these projects remain profound. 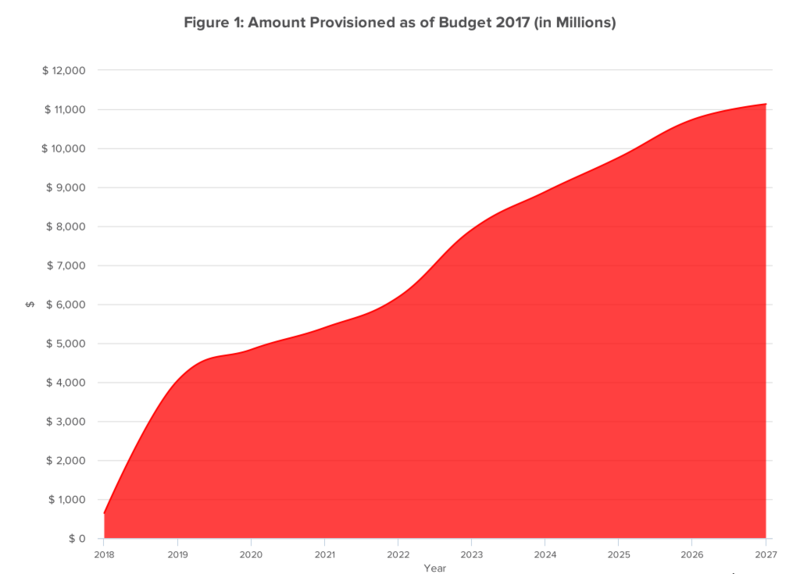 As the focus of these budgetary allocations is on accelerating federal investments for the repair, rehabilitation, and/or modernization of national infrastructure—key components for an economy’s functioning—the significance is also profound. To these ends, it is worth taking a closer look at the expenditure mechanism of the bilateral agreements between the federal and the provincial and territorial governments. Apart from contentions that arose during percentage negotiations of contract liability, that is, what percentage each level of government will fund each of thenew infrastructure projects, the main issue was, and remains, in the words of Minister Sohi himself: “cash flow.” Sohi goes on to outline that projects are notbeing delayed or declined, but rather that lags are occurring due to payment structure. As it stands, the infrastructure spending is released only when contractual proponents submit receipts for reimbursement, viz., invoices. Big-ticket invoices occur only after the project’s completion—where construction timelines hence project completion lies beyond INFC’s control. Provided that the budget indicates that further adjustments (read increased spending lags) are on the horizon, it is important to understand exactly how expense claims from cities and provinces are processed and the corresponding lag that occurs between work taking place and federal money being spent. 1 Employed Canadians aged 15 and older. 2 Government of Canada. 2018. “Gross Domestic Product at Basic Prices, Construction and Manufacturing Industries.” Statistics Canada. 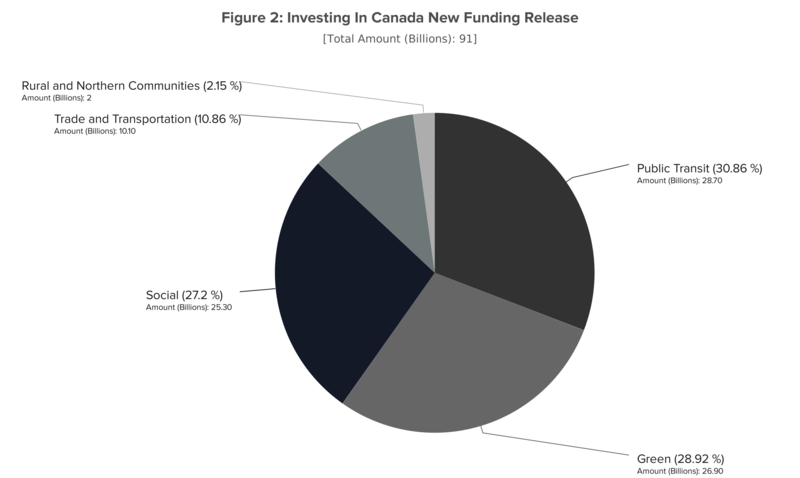 3 Figure adapted from Government of Canada. 2018. “Budget 2018.” Budget Plan. 4 See Government of Canada. 2017b. “Investing in Canada Plan.” Infrastructure Canada. 5 $2.67 billion and $2.1 billion respectively.